Step 1: To install the Image Viewer Cp Gold ActiveX Control, begin by launching the setup file (imageviewercpgoldsetup.exe). Select the desired installation folder for the Image Viewer CP Gold ActiveX and continue with the installation on your development computer. Step 3: Create New VFP Project, select Documents tab, add New Form. 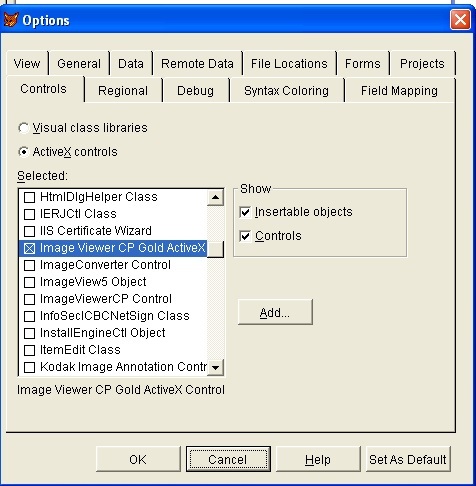 Step 4: In toolbar, click View Classes icon and select ActiveX Controls item, you will see Image Viewer Cp Gold ActiveX icon and then drag it to form. Step 6: When click select image button, it will call FileName or LoadMulitPage methods to load the image. Then you may draw the selection rectangle on image, select the type, click draw button. Step 7: You need add 4 properties to form. iSelLeft, iSelTop, iSelWidth, iSelHeight properties to hold the selection rectangle value. When you drawn the selection rectangle, it will fired SelectionRectDrawn event. Step 8: In Draw button click event, according your selected type, it will draw fillrectangle , circle, line or text. Step 8: In Undo Last Draw click event, according your selected type, it allow undo the last drawing item. Step 9: Finally you may save to single page file or multipage document if you loaded is multipage TIFF or PDF file.